Below the plaster floor, we found nothing. The plaster surface came apart easily with large picks and disappeared into buckets until, once again, Square 3,8 looked like a stubborn blanket of soil. 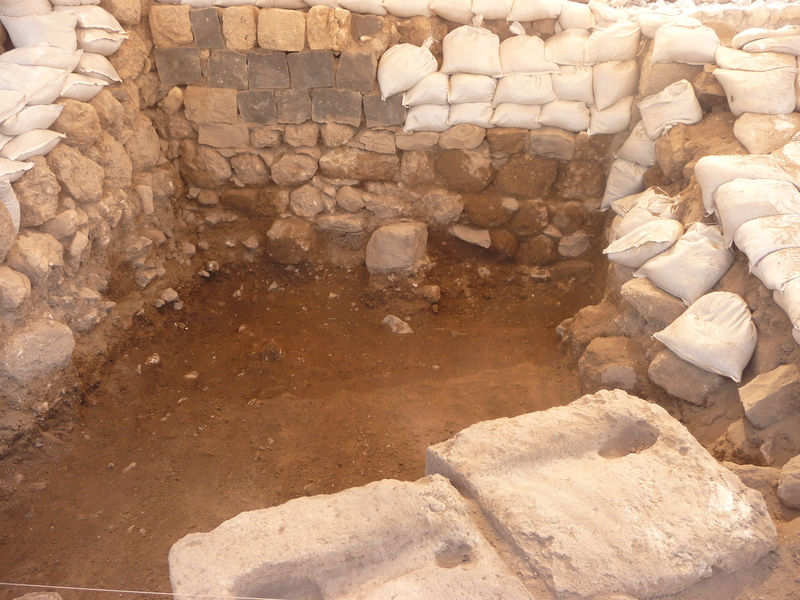 My team had already dug below the foundations of the wall bordering our square, and we were ready to discover Byzantine material. As we picked at the dirt underneath the plaster, however, we noted the same 20th century pottery shards that we found in previous days: signified by bright green and yellow glaze that coated traditional red-ware. While, last week, these vibrant colors filled me with great excitement, I—along with the other members of my team—suffered great discouragement these past few days in discovering these shards, for they forced us to realize that we faced heavy labor in a modern dump, and there might be no chance of reaching Byzantine artifacts before the conclusion of this month-long excavation. Furthermore, there was no evidence that Byzantine occupation had taken place in this location at all. At last, after spending a very long morning wheel-barrowing hoards of dirt from the dig site to the dump, our dig advisor finally granted us permission to close the square and move to a new location. For the most part, I was happy at the news: lugging empty dirt made me feel more like a slave than an excavator. On the other hand, I felt pathetic and defeated. We were supposed to find a synagogue wall from the 3rd century, and instead we relinquished our efforts in 20th century filth. Seth, our assistant dig supervisor, seemed even more dejected once our square was officially deemed useless. To a large degree, I feel I let him down. The Israeli dig advisors repeat a motto for discouraged excavators: “Finding nothing is just as important as finding something.” Well, we certainly found nothing, but I’m not yet sure how this fact might prove useful: pit 3,8 is still a mystery. For all I know, it might lead straight to Hell. If you think what you’re doing is useless, try going into advertising! i wallow in tagline trash every day, sometimes scooping out the occasional ancient headline. Anyway, sorry you’re suffering the effects of Square 3,8. Better luck on your next assignment!